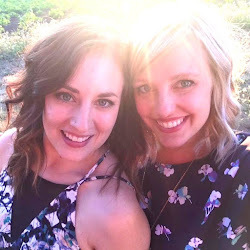 Katie and I planned on going to The Heathman for happy hour in December, but then the snow storm took over Portland and we weren't able to make it, so we decided to go last Thursday. The bar was surprisingly full for 4:45 pm so we were forced to take a seat at a round table rather than in one of the more comfy-looking booths. While we were tempted by the only $6 drink on the menu, we decided to go with our taste buds' best interests instead of our wallets'. 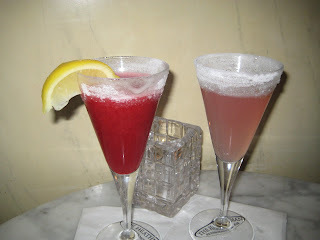 Katie ordered a Rasberry Martini ($7.50) and I ordered a Grapefruit Drop ($8.50). Both were really good and we highly recommend them despite their price tags. Plus, we received complementary bread so that pretty much evened things out in our eyes. After puzzling over some menu items (chevre? croquant normande? 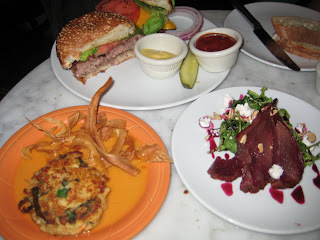 ), we chose to share a burger, a crab cake, and the roasted pear and chevre (goat cheese) salad. All the items were really delicious (although Katie did feel that their burger was slightly too salty) and very affordable compared to their ordinary bar/dinner menu. Our food total was just under $14 which means that we're definitely considering a return visit to try some of the other 15 food items on the menu. If you feel like giving The Heathman a try, we do have one last recommendation. Aviod plaid bubble dresses with snaps layered over a plain-T (hey, it's not a fashion blog, we all make mistakes) and maybe reconsider the jeans. Katie and I definitely felt a little underdressed, or at least obviously jobless and poor compared to the many people wearing suits and other outfits that reflected the fact that they were employed adults rather than college students.